It is impossible to squeeze over 20 years of intensive activity into a few pictures. Nonetheless, we have selected some highlights which we hope will convey the sense of excitement of those early years of vision, planning, implementation and finally fruition, as well as some unforgettable milestones and achievements since Schneider Children's first opened its doors in 1991. 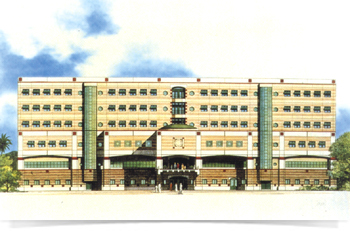 1985: Schneider Children's took on several shapes and forms in initial architectural renderings. 1987: First steps included many ceremonies... perhaps in the hope that they would help bring the dream closer to reality. All the "Who's Who" gathered at the President's House on October 23, 1987 for the Declaration Ceremony. 1988: The Schneider Family laid the Cornerstone Scroll beneath the building's foundations at the groundbreaking ceremony on April 11, 1988. "This hospital, dedicated to the inherent right of every child to live a healthy life in a peaceful world, will stand as a "bridge to peace" linking this nation to its many neighbors." 1989: First floors take shape. Two floors were planned beneath ground level to fulfill security needs. The huge hole excavated in Kaplan Street, where previously there had been agricultural fields owned by Haganah veterans, transformed within two years into the attractive and familiar edifice of Schneider Children’s Medical Center of Israel. 1990: Irving Schneider was involved in every aspect of the planning and construction. He received daily reports and visited at least once a month in order to observe progress up front. Here he stands with Nachum Pessa, then-Director of Clalit Health Services, alongside a model of the building against the backdrop of the hospital's atrium under construction. 1991: October 29, the formal opening of Schneider Children's Medical Center of Israel. Cutting the ribbon is Aura Herzog, wife of the President of the State of Israel and the President of Friends of Schneider Children's (formerly, the Public Council for Schneider Children's). 1992: During the first year of operation, only outpatient services were offered. 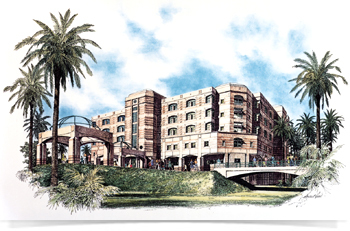 In 1992, internal medicine departments A and B were opened. On the eve of the "second opening", the Israel Philharmonic Orchestra dedicated a festive concert to Schneider Children's. In January, the Institute of Cardiology was dedicated; in February, the Cardiac Catheterization Lab was opened; and in March, history was made with the first operation…the first of many. Shown is Prof. Leonard Blieden, Head of the Cardiology Institute at the inauguration. The summer of 1993 was especially hot: the Hematology-Oncology Department moved from Beilinson Hospital to Schneider, and a month later, its laboratories; Neonatology opened three months afterwards. Prof. Rina Zaizov, z”l, head of the Hemato-Oncology Department gave the opening address at the dedication on August 12, 1993. September 20, 1993, the King of Pop, Michael Jackson, visited Schneider Children’s, creating great excitement among the children and his many fans who were waiting outside the hospital. 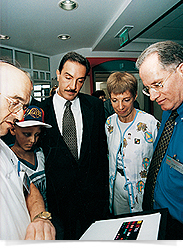 1994: William Brown, USA Ambassador to Israel, visited Schneider Children's as did Ezer Weizman, President of the State of Israel, and Mrs. Weizman. 1995: One of the founding principles of Schneider Children's is to serve as a bridge to peace in the region. During 1994, this theme was the subject of patients' artwork which was exhibited in January 1995. 1995: Up until 1995, Schneider Children's was called the "Children's Medical Center of Israel" because Mr. Schneider declined to have the institution bear his name. However, this misled the public who believed that the medical center was "just another department" in the adjacent adult hospital. Mr. Schneider was persuaded that the hospital needed an identity of its own and in July 1995, "Schneider Children's Medical Center of Israel" came into being. The auspicious occasion was attended by both Prime Minister Yitzhak Rabin and Irving Schneider, and included an exhibition of the hospital's milestones. 1998: A "bridge to peace" exemplified: Many children from Jordan, the Palestinian Authority and Lebanon have been treated at Schneider Children's over the years, and we hope that they will serve as "bridge to peace ambassadors". The Ambassador of Jordan, Omar Rifai, visited the medical center on July 17, 1998 and met with a Jordanian youngster being treated in the Oncology ward. Schneider Children's gained popularity not only due to its medical excellence, but also because of its impressive building and warm atmosphere. New records of achievement have constantly been attained, as shown here when six infants underwent surgery in the same week for transposition of arteries. In December, an artificial heart was implanted into a 16-year-old youngster, due to his critical condition, until a human heart was donated which it was, a few days later. Transplant Patients Plant Trees - Schneider Children's, as befitting a leading medical facility, maintains close follow-up with its patients with complex health problems. 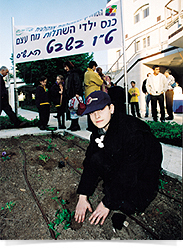 In January 2000, 80 youngsters who had undergone bone marrow transplants arrived at Schneider Children's to plant trees on Tu B'Shvat, the Festival of Trees. Schneider International - By embracing children, Schneider Children’s embraces the world. International activities crossed many borders and continents, an important component in extending assistance to children's hospitals in developing countries such as Jordan, Poland, Turkey and China. Schneider Children's welcomed a delegation from Shanghai Children's Medical Center. 2001: On October 23, 2001, Schneider Children's hosted a large party for its staff of over 1000 employees. A fitting celebration to the first decade of exemplary service. 2002:The Pediatric Nuclear Medicine Unit opened with great fanfare in April 2002. It is the first and only such unit dedicated to children in Israel and the Middle East. 2003: Domino Transplant - The donation of organs by the parents of an 11 year-old Palestinian boy initiated a domino transplant at Beilinson and Schneider hospitals, saving the lives of four children. During the marathon surgeries, the heart and lungs were transplanted into a girl of 13 with CF; her healthy heart in turn was transplanted into the body of another girl of 11; the liver and a kidney was given to another child and the second kidney to an 8-year-old. 2003: The Remedia Incident - Specialists at Schneider Children's discovered a string of rare neurological presentations in a number of babies. Investigation revealed that all the infants were being fed with a non-dairy milk substitute produced by Remedia. 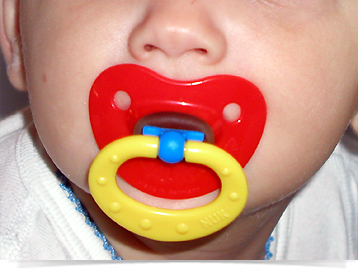 Following Schneider Children's alert, the Ministry of Health ordered all Remedia products to be removed from merchants' shelves within 24 hours, thus preventing a much greater tragedy. It was subsequently found that the substitute lacked an essential component, Vitamin B1, which caused severe neurological damage to the infants. 2004: During the week of Rosh Hashanah 2004, the Jewish New Year, a string of multiple organ transplantations were conducted. One included an altruistic donation of a kidney – Eric Swim gave one of his kidneys to Moshiko Sharon - while another two were transplants in the youngest kids ever: a liver in a 7 month-old infant and a heart in a 3 year-old boy. Opening of the 6th Operating Theater - The new state-of-the-art operating theater was opened in August to conduct elective surgeries, such as tonsillectomies, hernias, minor plastic surgery, that require day hospitalization. 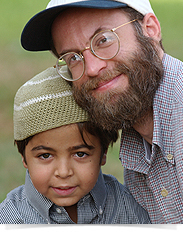 Bridge to Peace - In March 2005, a 28-year-old man named Majed Rauf from Kirkuk, Iraq, was referred to Schneider Children’s, having suffered from a congenital cardiac defect since birth which had kept him housebound. Prof. Rina Zaizov, Israel Prize Laureate - Prof. Rina Zaizov, founder of Pediatric Hematology-Oncology in Israel and first Director of the Hemato-Oncology Department, was posthumously awarded the Israel Prize for Medical Research. First in Israel - A rare open-heart operation was successfully conducted in a premature baby weighing just 800 grams. Cardiac surgery had never been attempted before in Israel on such a tiny infant and there are only a few documented cases in the world. Schneider in the Community - Schneider Children’s opened its first local branch, effectively bringing specialist hospital services into the community. 2007: Schneider Children’s agenda focused on expansion plans of several key departments including the ER, Day Care Hospitalization, Cardiac Catheterization and Cardiac Intensive Care. The Cardiac ICU was the first to be completed in November. Transcatheter Pulmonary Valve Replacement - Representing a technological breakthrough, an artificial pulmonary artery valve was successfully implanted via catheterization in children suffering from a congenital heart defect (CHD). Until then, valve replacement required open-heart surgery. 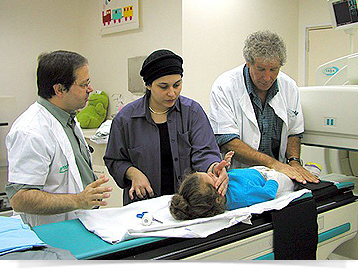 Schneider Children’s was one of 40 centers in the world – and the only one in Israel – to be selected by the manufacturers to utilize the advanced system. Multi-Organ Transplant - For the first time in Israel, a multi-organ transplant was performed of the colon, small intestine, liver, stomach and pancreas. Renovated Hematology-Oncology - After more than a year of reconstruction, the Hematology-Oncology Division moved back into their upgraded department. Defibrillator for 4-month-old - A rare operation implanted a defibrillator in a 4-month-old infant. There are only a few recorded cases in the world of defibrillator implants in infants and children under 20kgs, but none of a baby weighing just 4 kgs. New Catheterization Room - The second cath lab was opened and integrates pediatric cardiology with invasive radiology procedures. Prof. Zvi Laron, Israel Prize Laureate - Prof. Laron was awarded the 2009 Israel Prize for Medical Research. Zvi Laron, Professor Emeritus of Pediatric Endocrinology, Tel Aviv University and Director of the Endocrinology & Diabetes Research Unit at Schneider Children's, was recognized for his groundbreaking studies on growth hormone activity, which influenced the treatment of children of short-stature. His findings were and are considered medical milestones to this day. Expanded ER Opens - After more than a year of reconstruction and complicated logistics, the upgraded and expanded Emergency Medicine Department opened. The new ER introduced many changes including treatment tracks for smoother patient-flow. New Gene Identified - Schneider scientists identified SOBP, a new gene responsible for the development of mental retardation. The results of the research were published in the October 2010 edition of the American Journal of Human Genetics. In Israel: Video Capsule Endoscopy for children under 2 - Schneider Children's introduced advanced capsule technology for the diagnosis of colon disease for children from the age of two or younger (weighing 10kg). The test, which previously was only used for children over the age of 10, is only conducted in Israel by the Institute of Gastroenterology, Nutrition and Liver Diseases. In the World: Artificial Pancreas Breakthrough - The Artificial Pancreas, aimed to provide a real solution for diabetics, was tested successfully outside the confines of the hospital by a team of specialists. The innovative trial of the MD-Logic Artificial Pancreas (MDLAP) illustrated the potential of a “normal” life for diabetic youngsters. "Pediatrics: Past, Present and Future", an international scientific conference was held in Tel Aviv. The event attracted pediatric specialists from Israel and abroad. "Heartbeat”, an exhibition of photographs taken pro-bono by Ziv Koren, an award-winning world-renowned docu-photographer, opened in honor of the 20th Anniversary. “Heartbeat” was subsequently exhibited at the United Nations in New York. First in the World: 3-D Hologram of the heart in real-time - A research trial at Schneider Children’s successfully tested a 3-D Hologram of the heart during cardiac catheterization of 8 children, in cooperation with Phillips (Phillips Healthcare) and RealView Imaging Ltd. Clinical research proved the ability to create a 3-D cardiac hologram from the image obtained through ultrasound and fluoroscopy during catheterization. 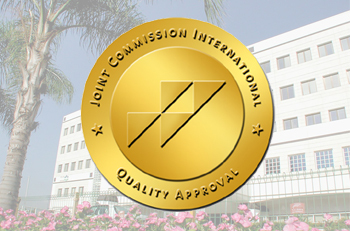 Prestigious JCI (Joint Commission International) accreditation was accorded Schneider Children's. The hospital also received the advanced insignia of QPS – Quality of Patient Care – grading it second in the world following a hospital in Japan and attained the highest level in the area of FMS – Management of Hospital Infrastructures and Safety. Schneider Children's received ISO-14001 certification for proper environmental management. Certification was accorded by the Institute for Quality and Control (IQC) together with the "Target Green " company. Two brothers were discharged from Schneider Children’s four weeks after they were rushed in critical condition from Jerusalem following fumigation poisoning. From the moment the brothers arrived in the Cardiac Intensive Care Unit at Schneider Children’s, the medical team fought valiantly to save the children’s lives. Their progress was followed by the entire nation in Israel. 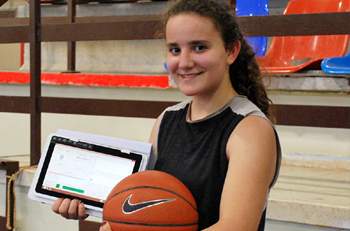 Artificial Pancreas Project - Yet another breakthrough was achieved by specialists in the Institute of Endocrinology and Diabetes, the National Center for Childhood Diabetes, at Schneider Children’s. The latest trial successfully tested management of patients’ glucose levels over three consecutive days via a digital tablet, thus obviating the need for diabetics to check glucose levels at all times of the day and night.